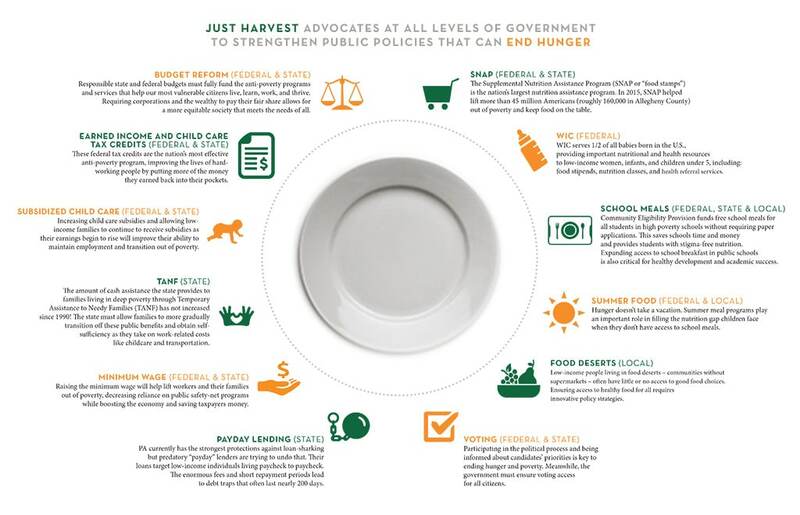 Just Harvest’s advocacy helps bend public policy toward justice. At Just Harvest, through advocacy and lobbying, we push government at all levels to ensure a fair and just society. Pervasive, chronic hunger is a clear sign that our economic, political, and social systems are not operating as they should. Only government has the power, wherewithal, and reach to address the systemic problem of food insecurity at its root: poverty. protecting and strengthening the social safety net programs that lift people out of poverty and boost access to nutritious food. Legislation that takes seriously the concerns of people in poverty. Each piece of legislation – whether shaping huge national programs or specific city policies – presents an opportunity for justice. Just Harvest advocates at every level of government, but centers our work on local impact. To find out more about our policy campaigns and how you can get involved, visit our Take Action page. Improved program administration by the federal, state, and local government agencies and institutions that oversee social safety net services such as food stamps, cash assistance, and child nutrition programs. Our relationship with our clients – who we help connect to these public programs – gives us the responsibility to improve these programs as we are able. Large improvements in social services are possible within existing legislation by addressing policies on staff training, program efficiency, outreach, and accessibility. Fair treatment of clients as they navigate safety-net bureaucracies. Whether it is a food stamp participant who has been denied benefits unfairly, or a mother on welfare seeking work exemption because of illness, we are here to help clients get what they need. If you or someone you know needs help visit our Get Help page. For further information or assistance, please contact our public policy advocate An Sanders at (412) 431-8960 x109 (or via email) or our community organizer Helen Gerhardt at (412) 431-8960 x105 (or via email).